A chamber pot is a portable toilet, meant for nocturnal use in the bedroom. It was common in many cultures before the advent of indoor plumbing. "Chamber" is an older term for bedroom. The chamber pot is also known as a Jordan, a jerry, a guzunder, a po (possibly from French: pot de chambre), a potty pot, a potty, or a thunder pot. It was also known as a chamber utensil or bedroom ware. Chamber pots were used in ancient Greece at least since the 6th century BC and were known under different names: ἀμίς (amis), οὐράνη (ouranē) and οὐρητρίς (ourētris, from οὖρον - ouron, "urine"), σκωραμίς / (skōramis), χερνίβιον (chernibion). The introduction of indoor flush toilets started to displace chamber pots, in the 19th century but they remained common until the mid-20th century. The alternative to using the chamber pot was a long cold walk to the outhouse in the middle of the night. Chamber pots continue in use today[update] in areas lacking indoor plumbing, such as rural China. In the Philippines, chamber pots are used as urinals and are known as arinola in most Philippine languages, such as Cebuano and Tagalog. In Korea, chamber pots are referred to as yogang (요강). They were used by people who did not have indoor plumbing to avoid the cold elements during the winter months and are still used in North Korea to this day. A chamber pot might be disguised in a sort of chair (a close stool). It might be stored in a cabinet with doors to hide it; this sort of nightstand was known as a commode, hence the latter word came to mean "toilet" as well. For homes without these items of furniture, the chamber pot was stored under the bed. The modern commode toilet and bedpan, used by bedbound or disabled persons, are variants of the chamber pot. The term "potty" is used when discussing the toilet with small children, such as during potty training. 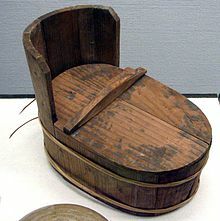 It is also usually used to refer to the small, toilet-shaped devices made especially for potty training, which are similar to chamber pots. These "potties" are generally a large plastic bowl with an ergonomically-designed back and front to protect against splashes. They may have a built-in handle or grasp at the back to allow easy emptying and a non-slip bottom to prevent the child from sliding while in use. Some are given bright colors, and others may feature gentle or unoffensive drawings or cartoon characters. 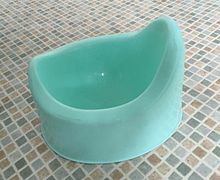 In many cases they are used since it is difficult for children to maneuver themselves up onto the normal toilet; in addition the larger opening in the regular toilet is much too wide for a child to sit over comfortably and not fall in without some type of aid. Their size means they can be packed away in a bag for days out or when camping with young children, and can be placed near or under beds for sufferers of nocturia or some other form of incontinence. "The Crabfish" is an old tale, the moral of which is, look in your chamberpot before you use it. Philippine mythology recounts that giving newlyweds a chamberpot assures them of prosperity. President Elpidio Quirino, as part of a smear campaign against him, was falsely rumoured to possess a golden arinola. Thomas More in his satire Utopia had chamberpots made out of gold. Wikimedia Commons has media related to Chamber pots. ^ "jordan". Oxford English Dictionary (2nd ed.). Oxford University Press. 1989. ^ "Shakespeare's World in a 100 Objects: Number 1, a "jordan"". findingshakespeare.co.uk. ^ ἀμίς. Liddell, Henry George; Scott, Robert; A Greek–English Lexicon at the Perseus Project. ^ οὐράνη in Liddell and Scott. ^ οὐρητρίς in Liddell and Scott. ^ οὖρον in Liddell and Scott. ^ χερνίβιον in Liddell and Scott. ^ Wolff, John U. (1972). "arinúla". A Dictionary of Cebuano Visayan. p. 56. ^ Ocampo, Ambeth (9 March 2010). "'Mambo Magsaysay' and Quirino's golden 'orinola". Inquirer. Archived from the original on 2013-09-27. Retrieved 26 September 2013. This page was last edited on 30 January 2019, at 02:19 (UTC).